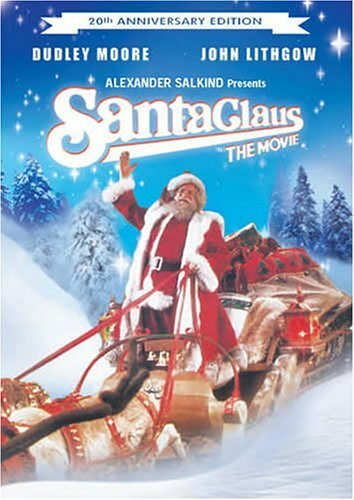 Santa Claus: The Movie (1985) You would think that the mash-up of Superman and the Santa Claus mythos would, at the very least, be interesting. You would be wrong. The Christopher Reeves starring Superman was such a hit that the producers decided to ape the origin story arc and apply it to Santa Claus. Interesting in theory, but so poorly mishandled by almost everyone behind the scenes (and some in front of the camera) that the resulting mess is a sugary, ridiculous, lifeless, bit of coal in the stocking. The movie was made by people who not only know better, but have proved themselves in other greater projects. Some of the casting is OK. David Huddleston is decent as Santa, though given very little to do emotionally. Dudley Moore, as a genius elf who can’t fit in, likewise, is fine, despite the consistent obstacles of increasing silly dialogue. John Lithgow, on the other hand, is so over the top awful as an evil toy manufacturer that you almost forget what a fine actor he CAN be. The direction is lackluster. The visuals often muddy. The score is one of the few truly unmemorable scores by Henry Mancini with its cheesy “celebration” jigs and mawkish kid’s chorus’s. You know a movie is bad when the documentary (included in the extras) is more fun than the movie. 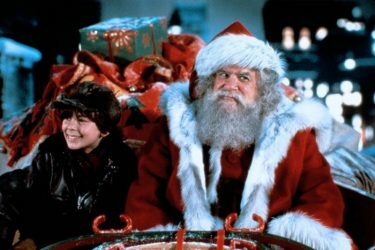 Santa Claus: The Movie (1985) Is a garish, unnecessary, and creepy ham-fisted mess of a Christmas movie. Here’s the deal. Santa and the Ms. die after foolishly getting caught out in a blizzard. A magical star and some goofy elves make Mr. and Mrs. Claus un-dead and eternal, setting them up in a palatial edifice at the North Pole. Santa then assumes the role of the chosen one, as decreed for no apparent reason by Rocky’s dead trainer (Burgess Meredith). This movie has more people coming back to life than Matthew, but I digress. For centuries Santa continues to do what a good Santa should, deliver toys to all the boys and girls. 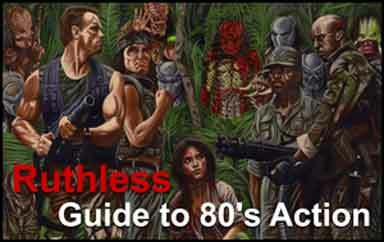 The movie fragmented into several sub-plots that were even more stupid than the main story. As you might imagine, things got screwed up royally. 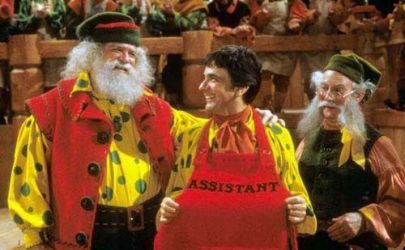 Patch, an Elf played by Dudley Moore, was vying for the position of #1 Santa Assistant. To win the position, he implemented some ill-advised short cuts that resulted in sub-prime toys, and a chaos of returned toys. He left the North Pole in disgrace and decided to hook up with a shady toy manufacturer run by B.Z. (John Lithgow). Of course, B.Z. uses the elf magic for evil, and tries to put Santa out of business. Oh, the horror. I will not spoil this wonderful Christmas classic, but Santa Claus: The Movie goes into a death spiral. It morphs from mediocre, to preposterous, to soul-killing. Great actors like David Huddleston and John Lithgow are transposed into wooden, un-funny morons. “Little friends, we’ve got ourselves one heck of a problem”, Santa tells his reindeer. Yes, you do. He should have used his magic to obliterate every copy of this movie, and Jeannot Szwarc owes the world an apology for this miscarriage.